Here’s the second group of purchases. These are three cushion covers and three small glasses-case-sized pouches, all done in pattern darning. We also got these in Dilli Haat, in Delhi; from a Government-registered ethnic arts stall. In this case, the pieces were done by a Toda cooperative. 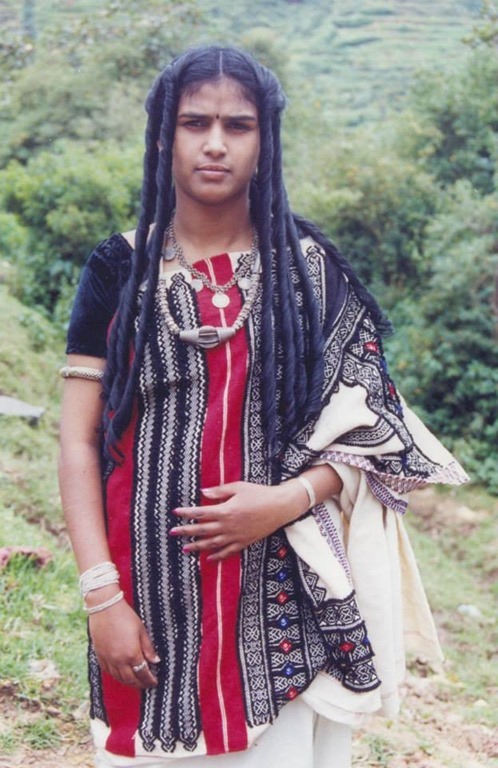 The Toda people are from South India in the Niligiri Hills and surrounding areas. Their traditional culture is pastoralist, centering on dairy herds. 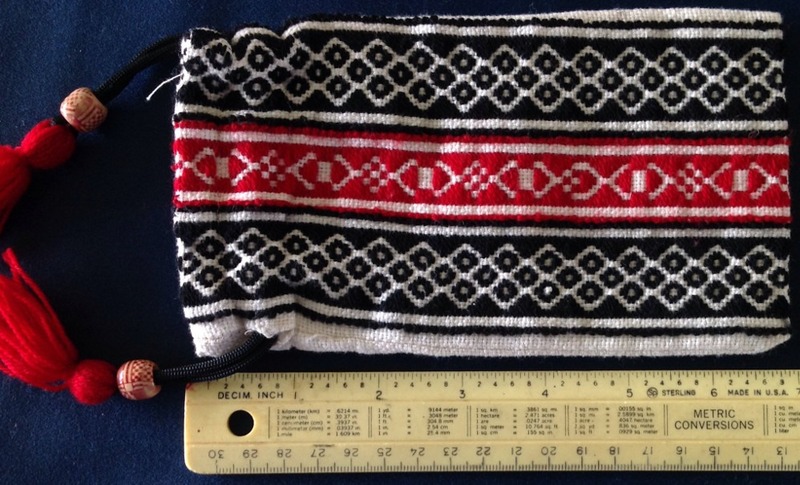 Their stitching, seen on a Toda’ woman’s outfit below, has been adapted for retail sale. The Dilli Haat vendor was selling the square cushions and small bags I bought, plus tote bags, larger throws, and bolster cushion covers (think cylinders, with the stitching going around the circumference). Image credit for the lady above: 6 Assago via the Fair Trade Forum – India, which also works with Toda cooperatives to market their crafts. 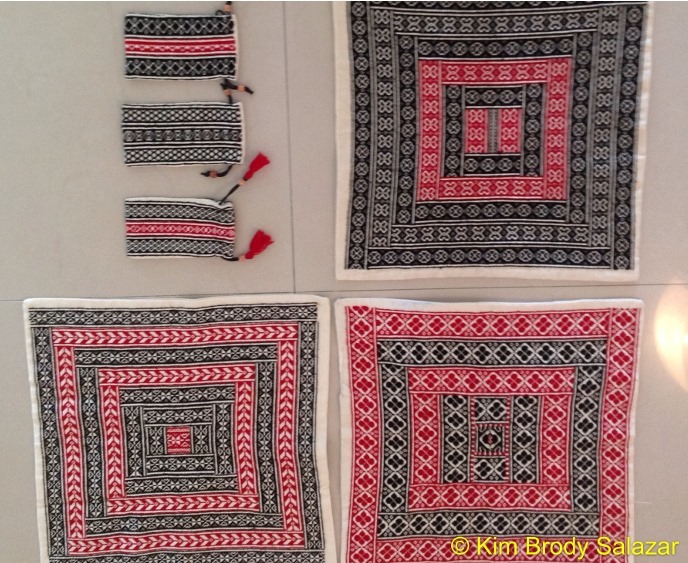 Anyone who is familiar with my love of black, red and white geometrical stitching will know I was especially delighted to find these pieces. It will be difficult for me to part with any of them, even though I bought them as gifts. In terms of technical specs, the white ground cloth is a bit like Aida cloth, even weave with a well defined “stitch here” hole structure; at roughly 20 doubled threads per inch. The thread used looks to be an acrylic lace-weight plied yarn. It’s a bit friable, so gentle care is in order to minimize surface fuzzing. The pouches and cushion covers are lined, so seeing the reverse is problematic. Now, there are several embroidery styles in India that use pattern darning. For example, Kasuthi also employs Negi (weaving) stitch for individual stand-alone motifs or for borders in which the stitches form the foreground. But the Toda style is a bit different. It’s characterized by strips of uniform patterning, with the stitching making up a solid background against which the unworked ground cloth peeps through in geometric designs. These are beautiful. I hope you bought a few more pieces than you need as gifts – you must keep some for yourself. I’ve got nine more months to find more textiles. And a couple of more posts queued on our other purchases. Not to fear! Oh, my these are quite lovely! I see why you gravitated to the black, white, red.